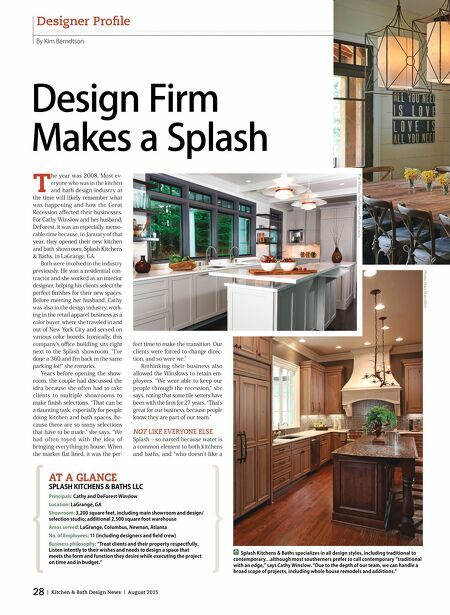 August 2015 | KitchenBathDesign.com | 29 splash of something?" she says – has been unique from the start. 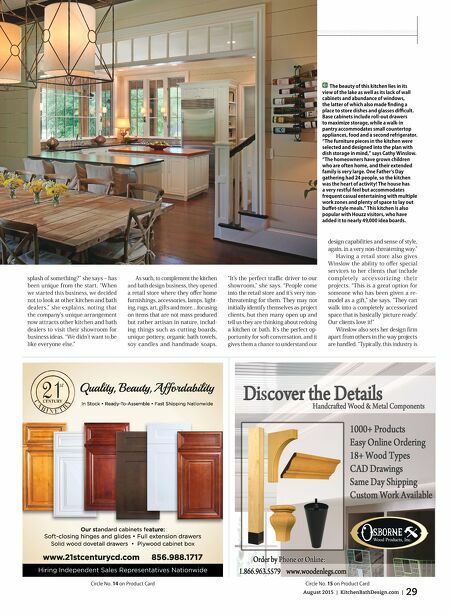 "When we started this business, we decided not to look at other kitchen and bath dealers," she explains, noting that the company's unique arrangement now attracts other kitchen and bath dealers to visit their showroom for business ideas. "We didn't want to be like everyone else." As such, to complement the kitchen and bath design business, they opened a retail store where they ofer home furnishings, accessories, lamps, light- ing, rugs, art, gifts and more…focusing on items that are not mass produced but rather artisan in nature, includ- ing things such as cutting boards, unique pottery, organic bath towels, soy candles and handmade soaps. "It's the perfect trafc driver to our showroom," she says. "People come into the retail store and it's very non- threatening for them. They may not initially identify themselves as project clients, but then many open up and tell us they are thinking about redoing a kitchen or bath. It's the perfect op- portunity for soft conversation, and it gives them a chance to understand our design capabilities and sense of style, again, in a very non-threatening way." Having a retail store also gives Winslow the ability to ofer special services to her clients that include completely accessorizing their projects. "This is a great option for someone who has been given a re- model as a gift," she says. "They can walk into a completely accessorized space that is basically 'picture ready.' Our clients love it!" Winslow also sets her design frm apart from others in the way projects are handled. "Typically, this industry is Circle No. 15 on Product Card Quality, Beauty, Affordability www.21stcenturycd.com 856.988.1717 In Stock • Ready-To-Assemble • Fast Shipping Nationwide Our standard cabinets feature: Soft-closing hinges and glides • Full extension drawers Solid wood dovetail drawers • Plywood cabinet box Hiring Independent Sales Representatives Nationwide Circle No. 14 on Product Card The beauty of this kitchen lies in its view of the lake as well as its lack of wall cabinets and abundance of windows, the latter of which also made fnding a place to store dishes and glasses difcult. Base cabinets include roll-out drawers to maximize storage, while a walk-in pantry accommodates small countertop appliances, food and a second refrigerator. "The furniture pieces in the kitchen were selected and designed into the plan with dish storage in mind," says Cathy Winslow. "The homeowners have grown children who are often home, and their extended family is very large. One Father's Day gathering had 24 people, so the kitchen was the heart of activity! The house has a very restful feel but accommodates frequent casual entertaining with multiple work zones and plenty of space to lay out bufet-style meals." This kitchen is also popular with Houzz visitors, who have added it to nearly 49,000 idea boards.